Homemade frozen yogurt is an easy, healthy, tangy and sweet treat that is perfect for spring. 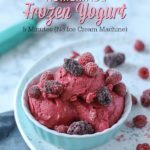 If you have a few minutes and a few simple ingredients, you can make this frozen yogurt recipe so quickly. Add ingredients to a food processor, and it’s ready to eat! You really can’t get any simpler than that. Follow my tips below to make the quickest and tastiest frozen yogurt treat. Frozen yogurt ingredients: yogurt, frozen berries, and honey or maple syrup. This post is sponsored by Oregon Raspberry and Blackberry Commission. All opinions are my own. Yogurt was one of my favorite foods growing up, but my kids are not as fond of it as I am. I’m not sure if it’s the texture or what, but they would definitely choose basically anything else over yogurt. But I love that yogurt is packed with healthy probiotics, calcium, fat and protein. This homemade frozen yogurt is a great way to get them to eat yogurt, but also make them think they are eating dessert. One of my kids’ absolute favorite foods is frozen berries, and boy, do we take advantage of that. 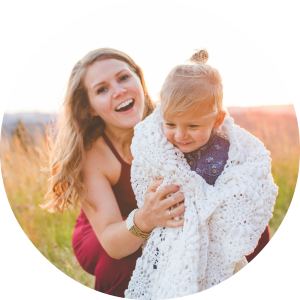 If you’re trying to get your kids to eat foods they may not normally like, one tactic is to pair those foods with something they do like. 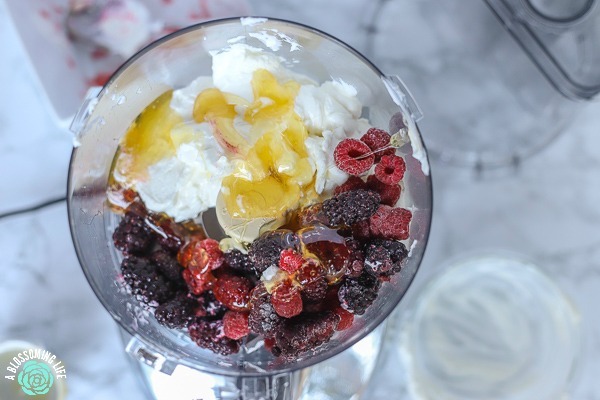 For us, adding our favorite frozen blackberries, raspberries, and marionberries to yogurt, with a little extra sweetness, makes something magical. Really, it’s a parenting win. Healthy dessert? Done. Eat dessert for breakfast? With this recipe, I’m not opposed to it. Dessert? Breakfast? They’re basically the same thing, right? You really can’t go wrong with all the health benefits of berries. They’re rich in antioxidants, fiber, and phytochemicals, which are all things I think we can never get too much of. Frozen berries are picked at the peak of ripeness, allowing you to get the health benefits of berries all year long. This healthy homemade frozen yogurt really packs a healthy punch. But does it pass the threenager? You bet! My 3-year-old inhaled this yummy frozen yogurt, and then demanded more, in a polite way, of course; my son just kept saying “Mo pss,” which means “more please” in 1-year-old language. I’ll take any healthy sweet treat. I love that this healthy dessert is made without refined sugar and utilizes honey, or maple syrup, instead. 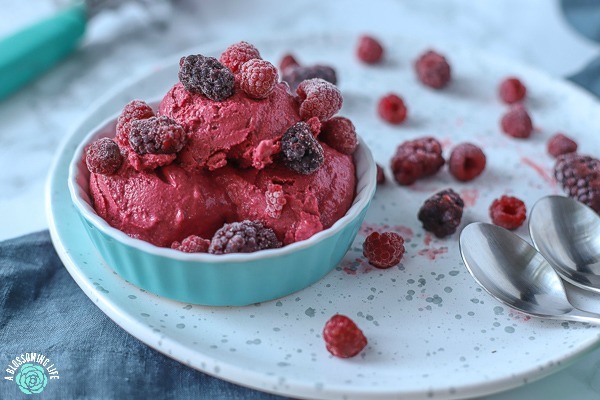 And I especially love that this frozen yogurt recipe is full of nutrients from frozen Oregon berries and yogurt. One of my favorite Oregon berries has to be the marionberry. You’ve probably never heard of it… I hadn’t either until the first summer we lived in Oregon, and now we are officially hooked. My daughter and I went to an antique store, and the sweet owner showed us around her farm. She let us pick fresh marionberries off the vines, and by the time we got home, August’s entire face was purple. She loved them so much that she basically smashed them all over her face trying to get them into her mouth. Marionberries are basically a magical blackberry. It’s like a super sweet blackberry, and has become a favorite in our house. You can find Oregon blackberries, raspberries, and marionberries in your freezer section all year long. And during the summer, you can pick up Oregon berries at your local farmer’s market, directly at the farms, and at your favorite grocery store. Whole milk yogurt will give you a better consistency and overall product. You can switch up the fruit – add more or less of your favorite berries to taste. Add frozen mangoes for a smooth, creamy consistency. You can swap out the honey for maple syrup if you prefer. Use Greek yogurt to keep this homemade frozen yogurt thick. If you only have regular yogurt, you can place a coffee filter in a strainer, add yogurt and allow the whey to separate. Just use the thick yogurt part and discard the whey. Use a food processor or a Vitamix to get a smooth consistency. If you are dairy free, you could swap out Greek yogurt for non-dairy yogurt, but the consistency will probably be a little different. A drizzle of caramel or almond butter. You may even be able to sneak in some veggies. 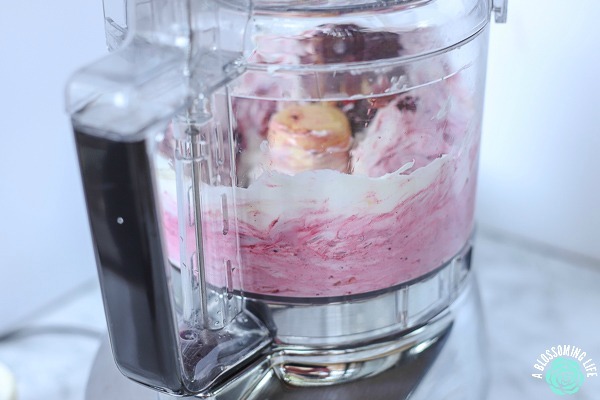 You could add a few frozen beets to make this homemade frozen yogurt even more hot pink! You will need a high speed blender like a Vitamix (or a food processor), spatula, and measuring cups. I just got a new ice cream scoop, so I was really excited to use it. It’s the little things. Whole milk Greek yogurt: whole milk gives it a better consistency and mouth feel. Frozen berries: Try a mixture of your favorite berries – blackberries, raspberries, marionberries, etc. Honey or maple syrup: I used honey, but maple syrup will also work. It will give it a hint of maple flavor. Step one: Place frozen fruit and Greek yogurt in a Vitamix or food processor. Don’t forget your honey – it really does bring out the sweetness in the berries! Step 2: Pulse a few times until frozen yogurt is smooth, stopping every so often to scrape down the sides. Step 3: Top with extra toppings (optional). Enjoy. Or stick in the freezer to harden up a bit. Recipe note: This is best enjoyed right away. If you need to freeze it for later, it will freeze hard and you have to let it thaw. The consistency will be different once thawed, but it will still taste pretty good. Want more healthy recipes ideas? Try these out! Baked French Toast Casserole With Blackberry Syrup has a sweet, custardy filling, and will become a weekend staple. Chicken and Bacon Chopped Salad With Honey Mustard Dressing is so good. Sweet, salty, crunchy, and delicious. Gluten Free Blackberry Banana Breakfast Bread is a simple and easy bake-ahead bread that makes a nutritious breakfast. Sheet Pan Chicken Fajitas are the perfect weeknight meal. One pan and easy clean up. 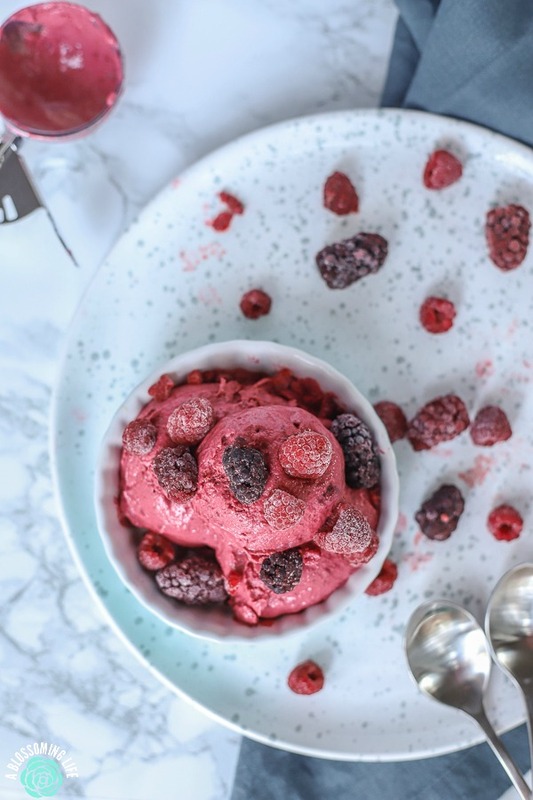 Simple homemade berry frozen yogurt made with just a few ingredients in the food processor. No ice cream machine required. Homemade frozen yogurt is an easy, healthy, tangy and sweet treat that is perfect for spring and summer. 3 cups frozen berries I used blackberries, raspberries, and marion berries. 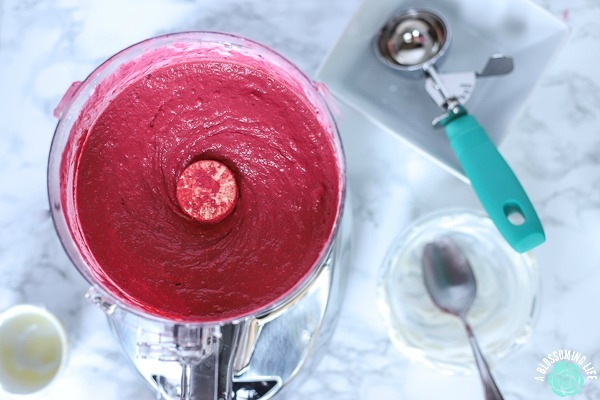 In a Vitamix or food processor, add frozen berries, yogurt, and honey. Pulse a few times and process until smooth. Serve right away, or pop in the freezer for a few minutes to harden up. You can place this in the freezer to freeze for later use. The consistency won't be exactly the same, but it will still taste delicious. If you want to purchase your own Oregon berries, check out the Oregon Raspberry And Blackberry Commission’s page to find out more. Have you ever made frozen yogurt before? Thank you Oregon Raspberry And Blackberry Commission for sponsoring this post. Lily was actually begging me to make this recipe this morning! So I did! It’s so light, sweet 🙂 this will be my go to recipe all summer long. Great tutorial with easy to follow instructions. I will give it a trial!! Cannot wait to try this. Will wait til Spring though.. so pinning so I have the recipe handy! Thanks. Still don’t have an ice-cream maker.. just don’t make enough ice cream etc to warrant the purchase so REALLY appreciate a tasty recipe like this one — as I do have a Vitamix.. so all set! Will try with local berries and I have some Saskatoon berries in the freezer (there’s one you may not know yet!) Thanks! I love how simple this recipe is! 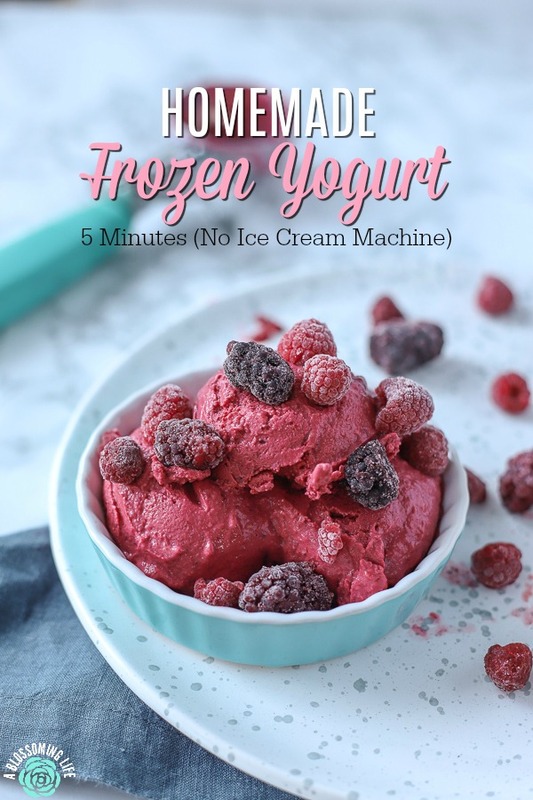 I’ve never tried making frozen yogurt before, but I’m going to get us some berries and give this a whirl. YUM!